The tiny petals are stitched with Berry Stitch . It is nothing but two lazy daisies stitched one inside the other. Do I have to tell you about the others? 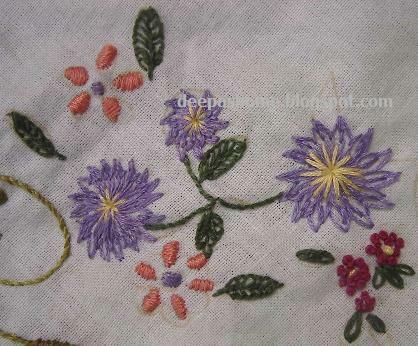 A filler in between... chemanthy flowers, satin stitch flowers, and french knot flowers with blanket stitched leaves. See the Chemanthy tutorials here, here and here . Next week, I'll show you the full view of the whole bedlinen. Hmm.. on second thoughts,should I? You're curious,aren't u? :) I've not even completed half of the pattern,a lot more blocks left. Be patient. I am following ur bed linen work.. nd little curious to see the entire piece. Lovely! Waiting with anticipation, VBG! Hope there is only one block to go (counting curiously every time you post the pictures of each block). The entire piece is going to be lovely. Hi Deepa, Its my first visit here. Must compliment you on your work - its extremely neat and comes out well. Looking forward to see the complete project. Good going Deepa. 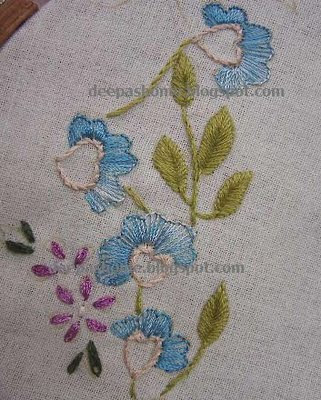 I am sure the finished linen will look gorgeous. Deepa, Haven't gone through all the stitches yet, but so far this is my favourite. The whole quilt is gorgeous..a marathon effort, but well worth it...looks perfect to me.